Feedback from Wulfie January 4, 2010. I want to share with everyone a recent comment regarding a Tarot Celtic Cross reading interpretation I did. Wulfie’s insights are truly helpful. Here is the link to my interpretation. 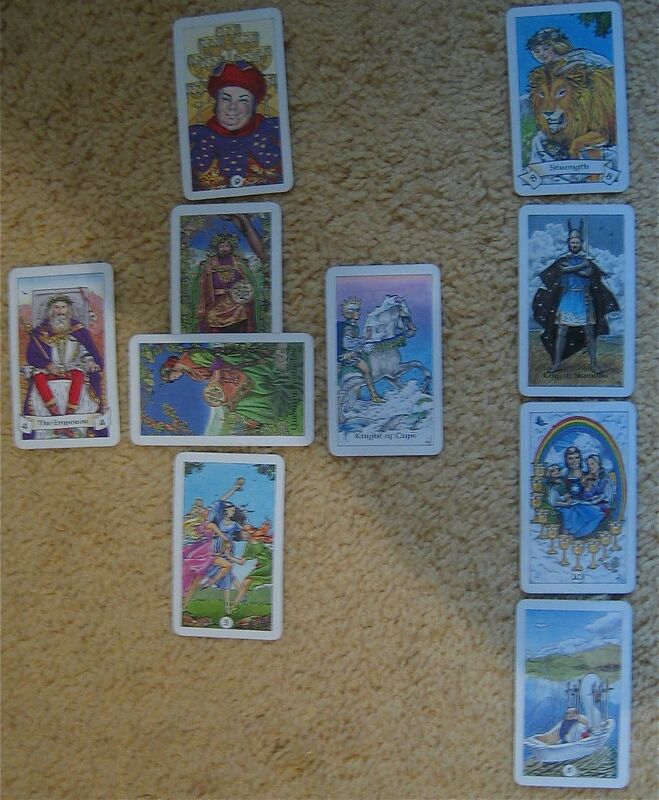 The image below is the actual Celtic Cross Layout. the form of the Emperor, this can sometimes be an alterative outcome card to the one in position 10. But the emperor is like the King of pentacle snd the King of swords…which are all control cards, and probably a male figure in the querents life, if not her more logical mind. Whoever it is and whether it’s an aspect of herself (like doubt or a bossy boy friend/husband, father/etc) it’s about control, logic, reason. The next card is another cup, the knight of cups so we’re back in the realm of emotions. But in this deck (Is it Robin Wood?) he’s facing AWAY from the central issue. To me that indicates he’s not supporting the materialism of the pentacles. Instead, he’s looking toward the emotions driving the need for materialims. To me the reading says she’s got a good chance of getting the job but that she misread the signals of it having been a good interview because she wants the job so badly in order to change her life circumstances. There’s also a suggestion that her emotions and blocking her from clear thinking and that the job isn’t really what she wants anyways. What she’d really love is something to do with creativity, not control. Was the job related to a position of power where she’d be giving out orders? If so, it’s likely she’d rather have had a lower job and be the one putting projects together, creatively. But that’s just my take on the cards. I’m sure there’s a million other ways to look at it too…especially AFTER the Fact.